Gado gado is a perfect afternoon meal in my opinion. This is partly because I like lots of snacks on my plate and also due to the fact that the high salad content is nice in the midst of sun-scorchingly hot day hours. 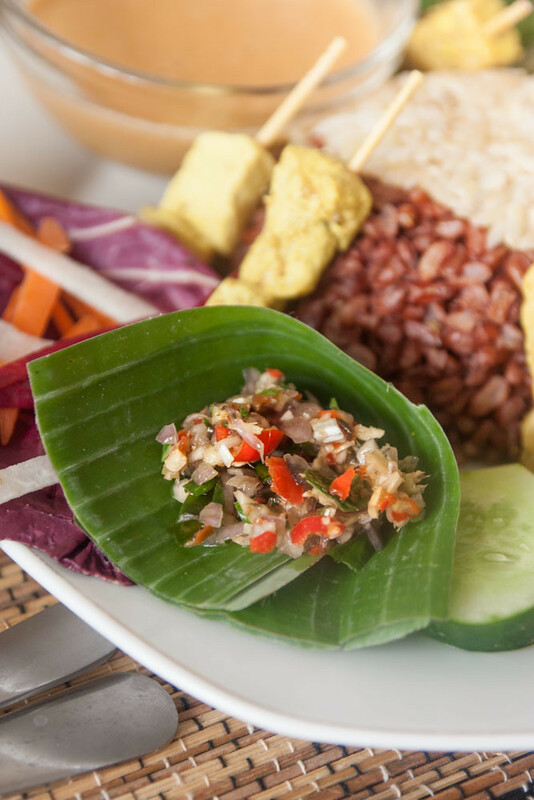 Dayu’s version of this ever popular Indonesian selection plate includes mini skewers of salty turmeric tofu and tempe, steamed green beans, leafy greens, carrot, red and white rice, and a salad of beetroot, daikon radish, and carrot sticks on lettuce. The sambal is red-hot, and adds real personality to the warm peanut sauce served with the selection of food. It does not, however, necessarily add personality to your dining companions. Perhaps you will strike the gold we did and spend half of your lunch giving a basic physics lesson to a fully grown Brit who, until now, did not know the earth spins on its axis. I’m not sure she had learning basic science in mind when she planned her middle class spiritual awakening, but she seemed grateful to learn something new. The presentation is really nice and the food simple and flavoursome. Dayu’s Warung wasn’t my favourite all rounder, but I thoroughly enjoyed my lunch and would happily return for seconds of the same. Man alive that looks like the perfect plate!